What is the 31 Day Challenge? 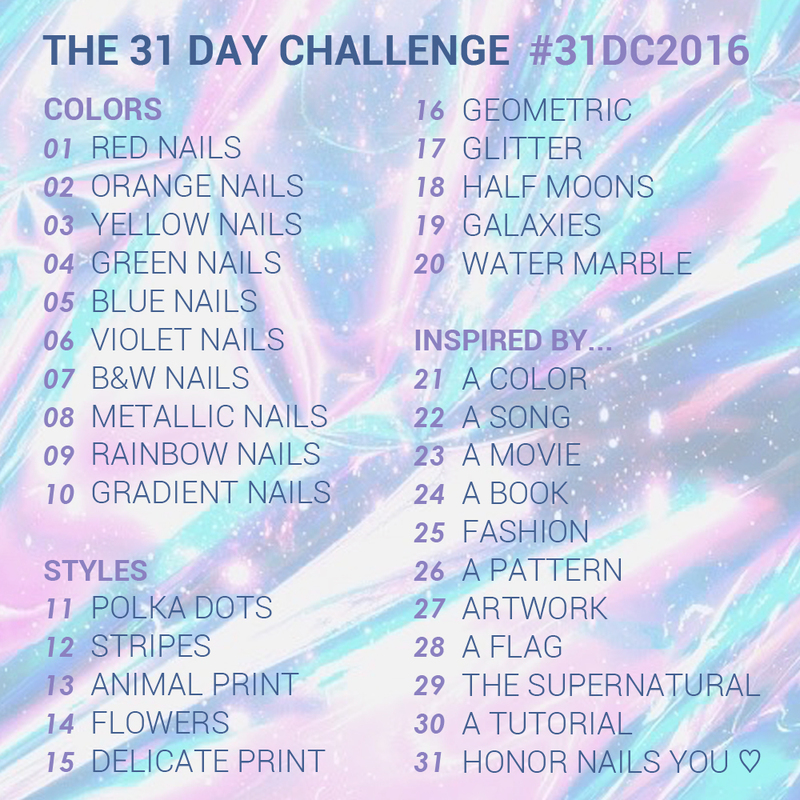 The 31 Day Challenge is a 31 day long nail art challenge, where participants create nail art inspired by 31 themes. The themes are broken up into three blocks: colors, styles, and "inspired by." The original intent of the challenge is to post one nail art look per day. Yes! The Challenge is open to anyone and everyone, beginner to advanced! I always begin on September 1st, but you can start up a challenge whenever you like. Why do you do it in a month with only 30 days? The first time I did the 31 Day Challenge was in September 2011, and I like to do it the same time every year. If you want to do it a different month, by all means, go for it! Why don't you ever change the prompts? I enjoy taking on the same prompts every year. Not only does it make think creatively for new ideas, but it lets me compare all of my work for a single prompt throughout the years. Looking at all of my "inspired by a movie" manicures together makes me happy! I can't lie to you guys, the 31 Day Challenge is hard! But the sense of accomplishment I feel at the end, the huge body of nail art work I produce, and the amount of practice it gives me, makes it all worth it. I do some of my best work under the pressure of the challenge, and it really gets me thinking creatively. Can I do it at a slower pace? Definitely. If you don't feel comfortable or don't have time to do it every day, feel free to space it out as needed. However, I will say that for me, a big part of the challenge is completing it in the allotted 31 days. Decide what's important to you and proceed as you see fit. No worries! You don't need a blog to participate. You can play along via social networks like Instagram, Facebook, Twitter, or Pinterest. 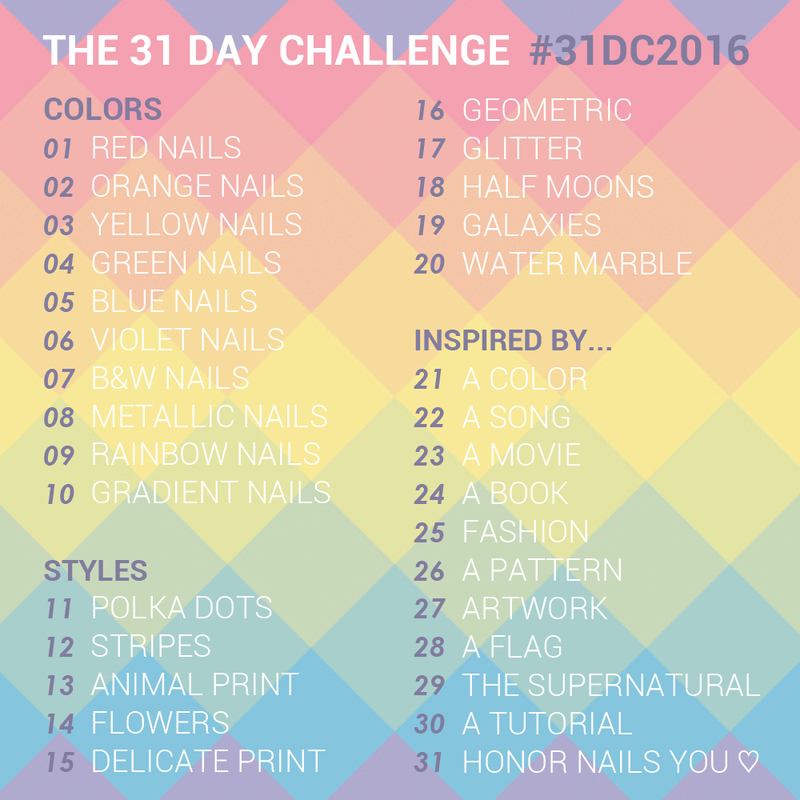 Just be sure to hashtag your work with #31DC2016. Do I have to do nail art? No. 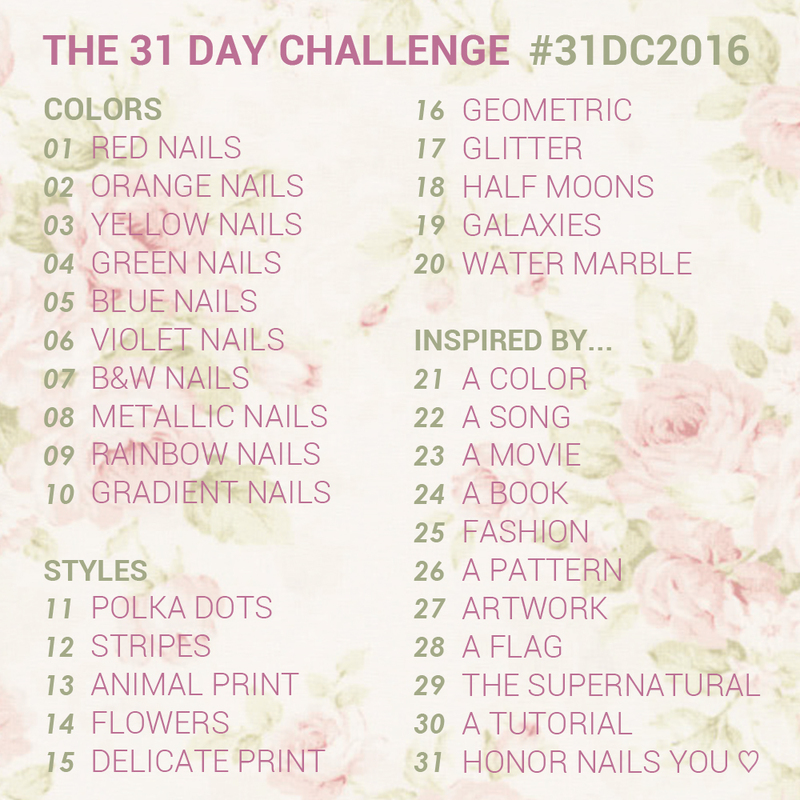 However, keep in mind that the 31DC can be a great opportunity to hone your nail art skills and really push your boundaries. I try to use the challenge as a springboard every year to get me to try new things and really advance my nail art. Will my nails get damaged from changing my polish so frequently? I've done this challenge for many years now, and my nails have never shown any signs of trouble. If you are worried about your nail health, try non-acetone remover or fortified acetone, and always remember to moisturize your nails afterwards with cuticle cream or cuticle oil. Is there an InLinkz link up for this? Cathy from More Nail Polish has been gracious enough to set one up for us! Get the codes on her blog. 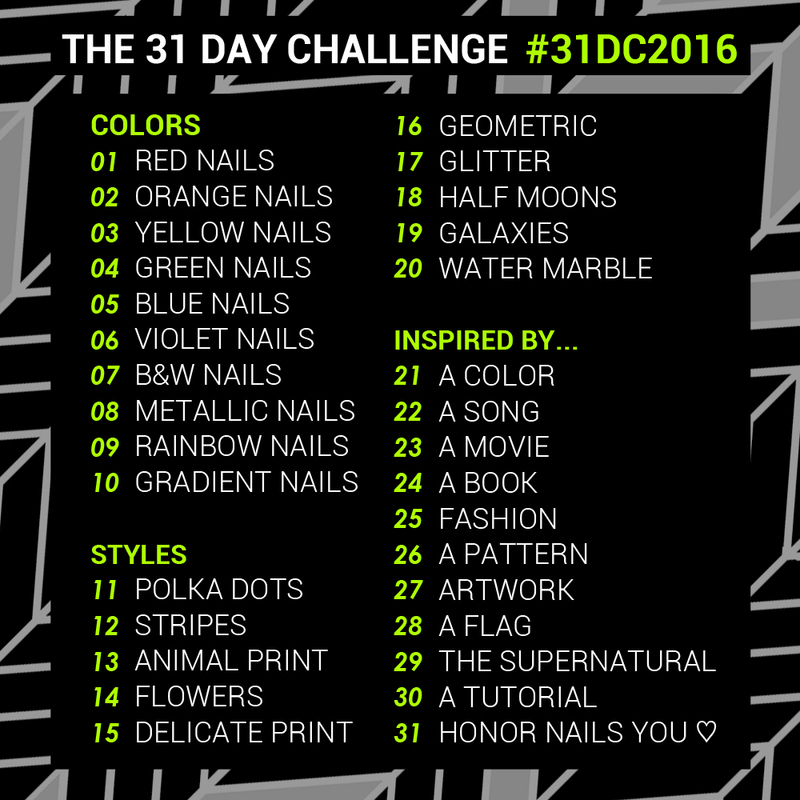 You can also use the official hashtag #31DC2016 to share your work and connect with other nail artists. Finishers will be awarded a badge they can display to show that they successfully completed the 31 Day Challenge! I don't own that many nail polishes. In my opinion, you don't need very many to participate. I'd suggest arming yourself with all of the primary and secondary colors, a black, a white, and a metallic or two. You could also get a cheap acrylic paint set and use that instead -- just make sure to put down a base of real polish first. Did you make up this challenge? No. I found the original challenge image floating around the Tumblr-verse in 2011 and have yet to identify the person that created it. What does the day 31 prompt, "Honor Nails You <3," mean? "Honor Nails You Love" means doing nails inspired by a particular manicure or a nail artist that you love and admire. Any other rules I should know? There are no rules to this, truly! One thing that I do encourage, though, is that you take the time to go around and comment on your fellow nail artists' work during the duration of the challenge. Part of what makes this challenge great is the sense of community that comes from taking it on together. Use the year's hashtags to browse everyone's work and discover some new artists! Ready to Start? Grab a Challenge Schedule!